The Hierophant bears the number five, a symbol of change. He represents an old character with white hair and beard. He wears a blue tunic and a red cloak. In front of him, two disciples are kneeling and seem to devote admiration to him. He blesses them his right hand. He is looking far away and seems to look towards the infinite. On his head he wears a three-scale tiara and holds a cross in his left hand. Those two papacy symbols refer to the image of the patriarch and the protector. The Hierophant represents the moral authority. He is loved for his generosity, his forgiveness and his goodwill. Extremely respected, he is a paternalistic figure who knows how to give good advice to his entourage. With the Lovers and Judgement he evokes love and union. He brings his blessing thanks to his wisdom and his knowledge of human desires. 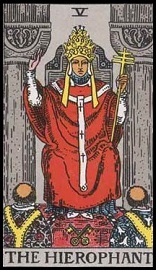 The Hierophant may seem narrow-minded as his moral leads to dogmatism and conformism. His appetence for teaching may lead him towards a form of authoritarianism when there is some disagreement. The Hierophant is a thoughtful person who knows how to take care of himself and his entourage. A great light animates you every day. The way you see things is clear and your spirit is lucid. You are welcoming: it helps you to be appreciated by your friends and to be seen as a good person, with a great heart and solid values. Be careful! It is great to trust yourself but do not be blind. Stay humble and beware the bad advice that some people from your entourage could give you. Keep alert, as you may be disappointed in the near future by some things happening around you. Find your confidence again. Listen your entourage, their advice will help you to get back on your feet and find yourself. You feel the need to let go, to find freedom and go back to simple pleasures: it is time to put things in perspective. Some time in the countryside would be great. You beneficiate form the Hierophant’s protection, it is an excellent thing. You have to feel reassured when you face the questions that you currently ask yourselves. You are tormented but the end of it is near, as you move towards a better future under the Hierophant’s protection, responsible for your happiness and your future successes. You are an excellent cycle! Success will soon reach you. Your projects will materialize and will be even more rewarding than you expected; you will realize your dreams. In love, you will be more and more confident and you will create some new relationships that will help you stay in a dynamic position. The world is yours: enjoy it.